Bishop William C. Newman, a native son whose diverse service to the Archdiocese of Baltimore included being a parish priest, superintendent of schools and auxiliary bishop, died May 20 at Mercy Ridge Retirement Community in Timonium. He was 88. In recent years, Bishop Newman had been slowed by heart and lung issues. A physically imposing figure, he possessed an even keel and gentle touch. His many friends included Father Willie Franken, who was the pastor of St. John the Evangelist in Hydes in 2001, when Bishop Newman took up residence at the parish in rural Baltimore County. “He was in an Emmaus support group for priests that I ran,” said Father Franken, the pastor of St. Joan of Arc in Aberdeen since 2010. “He became a great friend. Bishop Newman’s entire life, it seems, was spent in Baltimore’s Catholic institutions. William Clifford Newman was born Aug. 16, 1928, at Mercy Hospital. He grew up in Blessed Sacrament Parish on Old York Road, and attended its parish school. His first job was working for the parish as a sexton, cleaning the church, and its hall after parish card parties. “My vocation just radiated from my family experience,” Bishop Newman told the Review in 2003, when he turned 75 and formally retired as an auxiliary bishop. When we didn’t have much, we had to share and we looked out for one another. 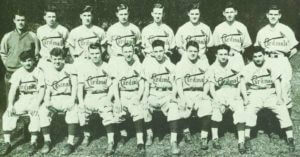 Graduating from Calvert Hall in 1946, he had opportunities to play baseball professionally, but instead entered St. Charles Minor Seminary in Catonsville. He would cite Father Henri Brianceau, a Sulpician priest who had served as a chaplain at Calvert Hall, in helping him choose the priesthood as a vocation. The Christian Brothers who ran the school supported the notion. Bishop Newman studied philosophy at St. Mary’s Seminary on Paca Street, 1948-50, and earned a licentiate in Theology from The Catholic University of America in Washington, D.C., 1950-54. He was 25 when he was ordained a priest for the Baltimore Archdiocese by Archbishop Francis P. Keough in the Baltimore Basilica. That was in 1954, the year construction began on the Cathedral of Mary Our Queen in Homeland, where 30 years later he would be ordained an auxiliary bishop. After brief assignments at St. Augustine in Elkridge and St. Joseph in Taneytown, Bishop Newman spent more than seven years as associate pastor of St. Elizabeth of Hungary in Highlandtown, on the north side of Patterson Park. The parish had 10,000 people, and 1,400 students in its school. The new priest taught religion to fourth-graders, basketball to the older kids, and, given his family background, was directed by the pastor to care for the Sodality and its Ladies of Charity. 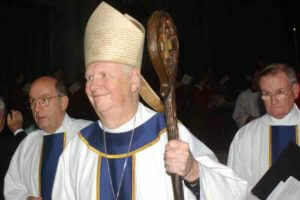 In 1962, he became the first principal of St. Paul’s Latin School, a new day seminary for high school-aged boys. 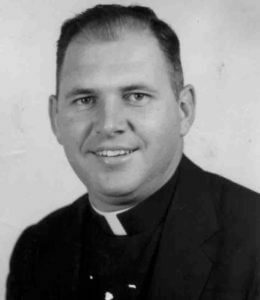 The students included a number of men who would become priests; the staff included Father Victor Galeone, now the bishop emeritus of the Diocese of St. Augustine, Fla.
Bishop Newman was elevated to monsignor in 1965, when he earned a master’s degree in education, administration and supervision from what was then Loyola College. In 1967, Cardinal Lawrence Shehan, the archbishop of Baltimore, asked him to be superintendent of schools for the archdiocese. “You don’t want me, I’m not a professional educator, I can’t get up and give all those great speeches,” Bishop Newman remembered telling the cardinal in 2003. “That would be just the reason I want you,” Cardinal Shehan replied. Bishop Newman took the job as thousands of Baltimore City families were leaving its parishes and schools for suburban counties. He began the painful contraction of the number of Catholic schools in the city. “Schools were like icons, and it was almost like treason or something to question whether we should continue in the same way,” he told the Review in 2003. Bishop Newman suffered a heart attack in 1974, just before Archbishop William D. Borders became the 13th archbishop of Baltimore. He became pastor of Ss. Philip and James near Johns Hopkins University in 1976, and in 1981 was appointed rector of the cathedral. According to a longtime colleague and friend, his stint there was marked by his personal nature – and his recall. “The very first time I met him,” said Mary D’Ambrogi, a cathedral parishioner, “was after my son, Mark, had served Mass. I introduced myself, and (Bishop) Bill said, ‘Oh, your Mark’s mom.’ I’ll always love him, just for that. Watching him greet people, his memory for names was startling. He would ask about your spouse by name, and your children. He did so with such sincerity. In 1984, Archbishop Borders had the pleasure of informing him that Pope John Paul II, now a saint, had appointed him to be an auxiliary bishop of Baltimore. For nearly two decades, under Archbishop Borders and then Cardinal William H. Keeler, Bishop Newman oversaw the Eastern Vicariate, which included 65 parishes in Anne Arundel, Baltimore and Harford counties. Whereas the population of the city and the number of its Catholic schools had shrunk during his years heading Catholic schools, those jurisdictions were growing. From Annapolis to Glyndon to Havre de Grace, pastors and their people found him accessible and available, for meetings and sacramental celebrations. At his episcopal retirement in September 2003, he talked of the more than 1,000 youths he had confirmed, a number that continued to grow. “I feel very privileged to be the channel of grace, bringing the Holy Spirit upon the young people I met along the way,” he told the Review. He added to the initial impression he made on D’Ambrogi, the cathedral parishioner, when a Maryland Catholic Conference retreat turned to the matter of child protection. Bishop Newman was a member of the U.S. Conference of Catholic Bishops’ committees on education, religious life and ministry, and Women in the Church and Society. He was a member of the board of directors of Good Samaritan Hospital, Mercy Ridge, Catholic Charities of Baltimore and Baltimore-based Catholic Relief Services, which he represented on a mission to Guatemala in 2000. He spent a good chunk of his life at the southwest corner of Cathedral and Mulberry Streets. Before the Catholic Center was built there, it was the location of Calvert Hall. Bishop Newman was inducted into the Calvert Hall Alumni Hall of Fame in 1985. Its Alumni Association sponsors a scholarship in his name; his service to his alma mater included chairing a capital campaign. “He was never formally stationed here, but the staff and alumni were always attracted to him,” said Christian Brother John Kane, president of Calvert Hall. “All you had to do is be in his presence to understand why. When you talked to him, he was focused on you, listening to you. That event was March 25. Three days later, Bishop Newman ventured to the cathedral for the funeral of Cardinal Keeler, using a walker to make his way on to the altar before the opening procession. The clergy he mentored ranged from a bishop in Massachusetts to the archdiocese’s next priest. Bishop Mitchell T. Rozanski, a fellow Baltimore native, succeeded Bishop Newman in the Eastern Vicariate. Later, Bishop Newman gave him a pectoral cross that commemorated the 25th anniversary of St. John Paul II’s pontificate. Deacon Kevin Ewing grew up at St. John the Evangelist in Hydes, and was confirmed by Bishop Newman. When he is ordained a priest for the Baltimore Archdiocese June 24, he will use Bishop Newman’s chalice. “He had kind of said, ‘I want you to take this chalice and make it your own – melt it down and reform it.’ I told him,” Deacon Ewing said, “I would appreciate much more the continuity of it, knowing it had belonged to him, and that it would be used in Masses. It was just another gesture of his great generosity. Bishop Newman is survived by two of his sisters, Evelyn Browne of California, and Doris Piasecki of Ocean Pines. Despite his own failing health, last December he offered the funeral Mass at the Stella Maris chapel for Franck, the one who shared the baseball anecdote from their youth. His generosity included sharing the sacraments with 24 nieces and nephews. 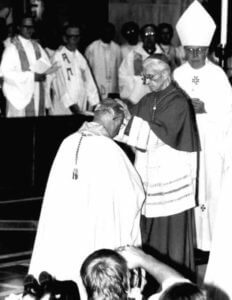 In 1970, he celebrated the wedding Mass of Olin to her husband, Stephen. 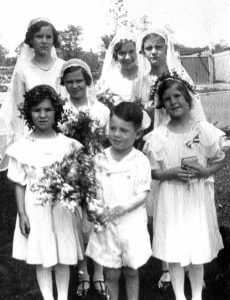 Later, he baptized and gave first Communion to their children, Jennifer and Peter. As his extended family added generations, Olin said, it took to gathering for Christmas at St. John the Evangelist in Hydes, in its former convent. 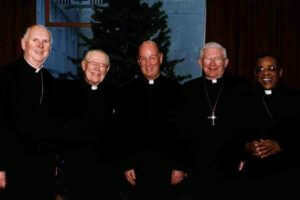 At the parish, Bishop Newman shared an off-campus rectory with Father Franken. “It was a split-level rancher; he had the lower level apartment to himself,” Father Franken said. “I would get home from a meeting, and stop down to see him. He would be watching the Orioles’ game or another sports event, and we would chat. Erik Zygmont contributed to this article. 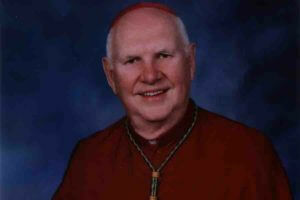 Read the Archdiocese of Baltimore’s media release on the death of Bishop Newman here. 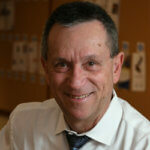 A viewing will be held May 28 from 2 to 8 p.m. in Laubacher Hall in St. Mary’s Seminary and University in Roland Park. Vespers for the Dead will be offered at 7 p.m.
A viewing will also be held May 29 from 9 to 10:30 a.m. at the Cathedral of Mary Our Queen in Homeland, where Bishop Newman had served as a former rector. A Mass of Christian Burial will be offered at 11 a.m. at the cathedral.